James Alexander Hamilton, Ph.D., M.D. The role that social support plays in prevention, intervention and treatment during pregnancy and the first postpartum year is based on research from cultural anthropology, psychology, sociology, nursing, and medicine. This research consistently has demonstrated that the lack of social support is an important modifiable risk factor for postpartum depression (Dennis, 2007). In general, parents with high levels of support are more satisfied with their babies, their roles, and with their lives overall and are less likely to develop postpartum depression (Kendall-Tackett,1993). In addition to scientific research, there is a body of consumer driven knowledge from the self-help movement. The progress of the perinatal social support movement has resulted from a convergence of knowledge, and collaboration among all of these disciplines. Dr. Hamilton’s words propelled self-help activists and health care professionals in their own communities into a global advocates’ network for maternal mental health. He was a visionary whose first book Postpartum Psychiatric Problems was published in 1962. In his introduction he wrote, “Of all the ailments to which the human mind and body are vulnerable, none is more catastrophic than serious psychiatric illness following childbirth” (Hamilton, 1962). It was Dr. Hamilton who proposed using “ppd” as a “generic term to relate to all of the groups to a common cause” (Taylor, 1996). Dr. Hamilton became the movement’s mentor until his death in 1997 at age ninety. Harry Harlow, Ph.D. was one of the most well known psychologists of the 20th century. There is a link between what his research with primates demonstrated about affection and relationships, and the field of perinatal social support. The Harlow legacy shows us that social isolation is devastating. For more than a decade the research conducted at the Primate Laboratory at the University of Wisconsin, Madison examined social support systems (Blum, 2002). His work and the research that followed his lead give us a view on love and the importance of social contact and support. Deborah Blum, said, “The nature of love is about paying attention to the people who matter, about still giving when you are too tired to give. Be a mother who listens, a father who cuddles, a friend who calls back, a helping neighbor, a loving child” (Giberson, 2003). Harlow’s findings have become incorporated into what is considered common sense childrearing practices today. He demonstrated the importance of mother, her role in providing constant comfort to her infant, as well as the significance of peer relationships and play. In 1975 he received a prestigious award and his work was praised as being “of extreme significance for understanding those aspects of human behavior related to depression which originate in the formative years of mother-infant interactions” (LeRoy, 2003). Dana Raphael focused on the link between successful breastfeeding and social support. She is a cultural anthropologist whose own experience led her to fifteen years of intensive research on breastfeeding in animals. She then studied how mothers are treated in the United States, and over two hundred other cultures (Raphael, 1970, 1976, 1981). Matrescence, or the time of “mother-becoming”, is the critical period when a girl becomes a woman (Raphael, 1975, 1988). This rite de passage is a process that includes not only biological states of pregnancy and birth but also her status, emotional state, identity, and relationships. Dr. Raphael introduced the word doula into our vocabulary as the person who assists the process of matrescence (Raphael, 1988). Doulas of North America (DONA) wrote its position paper on the role of the postpartum doula in maternity care in 2002. “The doula’s education, quiet support and guidance are a manifestation of the traditional postpartum support that our society is missing” (DONA). In addition to practical help the doula can offer new parents help with understanding the process of concrete problem solving. This extends to determining whether or not they have adequate social support (Kelleher, 2002). There has been a significant contribution from British researchers and health care providers to the field of perinatal psychiatry. Among the scientific founders of the Marcé Society were Professors R. Kumar and I. F. Brockington. They edited two scholarly books on Motherhood and Mental Illness during the 1980s. A growing body of research into psychopathology of reproduction demonstrated vitality in the field (Kumar and Brockington, 1982). Of particular importance has been the development of the Edinburgh Postnatal Depression Scale (EPDS). John Cox and Jeni Holden edited a book in response to a conference held in 1991 to discuss the increasing use of the EPDS within the context of strategies for prevention (Cox and Holden, 1994). An important contributor to the literature has been developmental psychologist Kathleen Kendall-Tackett. Her decision to write a book on postpartum depression for nurses came from her years as a child abuse researcher. She includes specific suggestions for interventions and referrals to appropriate community resources (Kendall-Tackett, 1993). A major researcher on postpartum mood disorders has been Michael O’Hara, Ph.D. at the Department of Psychology, University of Iowa. His work was supported by grants from the National Institute of Mental Health. All of the studies included the role of social support using tools such as The Childcare Stress Inventory, The Peripartum Events Scale, and The Social Support Interview (O’Hara, 1995). M. Cynthia Logsdon, DNS began her research interest in perinatal social support in the early 1980s. She became concerned with lack of support for new mothers and developed the Postpartum Support Questionnaire (PSQ) (Logsdon et al, 1996). It consists of 34 items and 4 Likert-type scales and is designed as either a self-report or by interview (Logsdon et al, 1996, Logsdon, 2003). Cheryl Beck, DNSc was the first to conduct a phenomenological study postpartum depression. Prior to her research the science had been based upon quantitative designs using questionnaires. Dr. Beck’s approach was to interview mothers who were suffering in order to describe the essential structure of the illness (Beck, 1992). Her research continued and by the end of the decade, Beck had developed a new screening scale. The Postpartum Depression Screening Scale (PDSS) improves detection through a 35-item Likert-type self-report instrument (Beck and Gable, 2000). The role that culture plays in understanding postpartum mood disorders is described by Wile and Arechiga (1999). They recommend that research studies devoted to parenthood rites of passage must have the following guidelines: 1) accurate descriptions of the symptoms that mothers experience, 2) account for the cultural medium in which the behavior is expressed, and 3) include observations by individuals culturally immersed to translate customs and rituals describing a woman’s pregnancy, birth, and postpartum experience. Using data obtained from 26,877 women with newborns in the state of Iowa, race/ethnicity was found to be a risk factor for depressed mood in late pregnancy and the early postpartum period. Lower levels of social support emerged as a possible explanation for why African-Americans reported more depression (Segre et al, 2006). Another recent multiethnic study conducted at community health centers near Boston, Massachusetts showed that having two or more friends or family members available for support lowered depressive symptoms in new mothers (Surkan, 2006). The concept of “helping one another” or “mutual-aid” is the foundation of what evolved into “helping others help themselves” or self-help. The pioneers of the 19th century in the United States, fueled by waves of immigration, joined together in activities of mutual support. They formed agricultural cooperatives, provided end-of-life services and, financial assistance (Zola, 1979). These are early examples of tangible forms of environmental social support. The evolution of providing emotional or psychological help is tied to how medical practices changed during the mid 20th century. Zola identified three basic barriers to the development of the self –help movement: 1) the nature of the groups’ problems, 2) types of help to deal with the groups’ problems, and 3) who would be appropriate for providing the help. His models focused on medical diseases considered to be “unacceptable”. These included both physical and mental disabilities. He described a range of stigma of having a perceived deficit such as hearing or limb loss to extremely taboo behavioral disorders of mental illness. As medical advances were made in eradicating infectious diseases, sanitation practices, and public health improved, there was a dramatic shift from curing patients to long term care. This included the need for medical management and it brought forth a change in patient-doctor relationships. An epidemiologist, John Cassel, used the term social support when describing the relationship between the vulnerability to disease and certain psychosocial processes (Logsdon, 2000). This shift opened an opportunity for patient involvement in illness treatment. It was the beginning of psychological self-help activities. New social movements like the American self-help movement are the result of people wanting to meet and create places to come together. Their tenacity to establish groups and networks provides a bridge between professionals and their own lived experiences (Taylor, 1996). In the early 1980s, Richard Marshall, MD was one of the first medical professionals to acknowledge the importance of new parent support groups or parenting networks as substitutes for family and friends. He worked specifically with parents and families of premature and sick newborns at a Neonatal Intensive Care Unit (NICU). His perspective was based on observations that “a certain kind of concern and mutual support is available only from those peers in whom issues of authority and power are not important considerations” (Boukydis, 1986). Dr. Marshall recommended that professionals see parents as colleagues and members of the team to improve health outcomes for the infants. He continues, “looking back, it seems obvious to ask consumers how we can better serve their needs, and yet in our professional training we are not taught to use such humility and common sense”. The 7th Edition of The Self-Help Group Sourcebook: Your Guide to Community and Online Support Groups published in 2002 by the American Self-Help Group Clearinghouse contained information on nearly 1,100 national and model one-of-a-kind groups, and international networks. There are four common characteristics present in groups defined as self-help. First, they represent a dynamic process of mutual help in which knowledge is pooled, experiences are shared, hopes are reinforced, and efforts are joined. Second, they are composed of peers sharing a common problem or stressful life situation, providing the message that the participant is not alone. Third, groups are voluntary, charging no or minimal fee for help. Last, the locus of control is the group, rather than professionals. These factors promote true ownership, a sense of responsibility, and the feeling of being a community (Madara, 1990). Sociologist Verta Taylor wrote extensively on the development of a formal postpartum social support structure in her 1996 book Rock-A-By-Baby. While at Ohio State University, she theorized that today’s social support movement was influenced by the larger women’s movement that began in the 19th century. This is attributed to women continually searching for acknowledgment of their own experiences (Honikman, 1999). A distinction that sets apart social support for new mothers from other forms of self-help is described by Verta Taylor as gender specific. The feminine aspects of self-help include 1) the concept that support groups promote the self-interest of each individual, and 2) caring for others is a route to individual empowerment (Taylor, 1996). British psychologist Jeni Holden describes befriending as an act that empowers a woman and helps her to gain a sense of her own competence. For example, one voluntary home visiting program, begun in 1992 throughout the United Kingdom, offers friendship, support, and practical help to young families (Cox and Holden, 1994). The first annual conference on “Women’s Mental Health Following Childbirth” was convened by this Chapter’s author on June 28, 1987 in Santa Barbara, California. Among those attending this historic event were the founders of Postpartum Education for Parents (PEP) in Santa Barbara, Depression After Delivery (DAD) from the states of New Jersey, Washington, Ohio, Pennsylvania, Utah, and the Pacific Post Partum Support Society (PPPSS) in Vancouver, and Calgary, Canada (Honikman, 2000). Dr. James Hamilton gave the keynote address. He recommended that the participants form an organization and call it Postpartum Support International. The Mission of Postpartum Support International (PSI) is to promote awareness, prevention and treatment of maternal mental health issues related to childbearing in every country worldwide. The nonprofit’s members are the consumers, self-help groups, and professionals who lead the postpartum social support and mental health movement. PSI’s infrastructure features a global social support network consisting of Area Coordinators who represent 50 states in the United States and 26 other countries. The PSI Office receives telephone calls and emails. From women, their families in need of support and information, and from professionals. When appropriate, these callers and emails are distributed to the Area Coordinators. The Website at www.postpartum.net was established during the 1990s at Indiana University in Pennsylvania. PSI continues to sponsor an annual conference whose theme reflects the current trends in the scientific research and the role of support volunteers. The grassroots organization is a member of the United States National Institute of Mental Health’s Outreach Partnership Program. On the global level, PSI is a member of the World Federation for Mental Health and has presented information about its worldwide network at their conferences on Mental Health Promotion and Prevention. Since the early 1980s there has been an ongoing relationship with the Marcé Society which promotes the international scientific research of perinatal mood disorders (Honikman, 2006). Central to the purpose of Postpartum Support International is the founder’s vision to have a social support network in every community worldwide. The principles of social support are derived from evidenced-based research which has shown that: 1) empowerment, 2) ethnic minorities integration, 3) positive interpersonal interactions, 4) social participation, 5) social responsibility and tolerance, 6) social services, and 7) social support and community networks are the protective factors of good mental health (World Health Organization (WHO), 2004). Social support has both genetic and environmental variables. It is about who we are, how we interact with others, and external stressors. It includes accepting who we are, as well as giving, getting, and giving back again. It covers three domains: 1) the extent to which individuals are attached to others, 2) the individual’s cognitive appraisal of the support, and 3) the response of others in the provision of support (WHO, 2004). During the 1980s researchers from several disciplines noted the relationship between the importance of social support and the promotion of mental and physical health. Initial research in the 1970s investigated the “more is better” approach of whether support decreased stress directly, improved coping skills or if it acted as a buffer to stress. It was found that support can be perceived as a burden if there was an expectation to give support back (Davis, Logsdon & Birkmer, 1996). There were specific findings that new mothers were concerned about their need for emotional support and prolonged postpartum depression (Kruckman, 1996). Environmentally there are a variety of social factors such as life stress, poverty, and child care that impact mothers and fathers. Research on postpartum depression concludes that a woman’s level of social support is the most influential. This research has shown the relationship between levels of self-esteem, self-efficacy, lowered anxiety and therefore, the prevention of postpartum depression. (Kendall-Tackett, 2005). A recent Canadian study examined the influence of both global and relationship-specific perceptions of support in the first eight postpartum weeks in a diverse sample of 594 mothers. It was found that relationship-specific (e.g., partner. mother, and other women with children) support was beneficial. Of significance was the issue of reliability and nurturance from her partner, as well as from other women with children. The conclusions suggested that strategies using relationship-specific interventions include positive alliances that provide opportunities for interaction with other mothers (Dennis, 2007). Social support has been classified into four types. These are: 1) material, 2) emotional, 3) informational, and 4) comparison. The first type of support is also called practical or instrumental help. Emotional support includes encouragement, affection, approval, and feelings of “togetherness”. The definition of informational support includes sharing advice, answering questions, as well as facilitating active problem solving. Comparison support is derived when encouragement, advice, or information are shared between individuals with similar or the same situations. (Davis, Logsdon & Birkmer 1996, Logsdon, 2003). Studies have shown that the predominant source of social support is provided to pregnant and new mothers by spouses (Logsdon, 2000). A recent study of 1216 families in ten United States locations investigated the presence and patterns of social support and childcare on the relationship between maternal depressive symptoms and child behaviour problems at two developmental stages. The results showed that social support was a contributing factor. The conclusions suggest that health providers examine what social support is available to mothers, especially those not severely depressed. Further recommendations include providing childcare so that mothers and their children can benefit from protective interactions with others (Lee, 2006). After offering emotional telephone and peer group support for 20 yearstheauthor wrote I’m Listening, A Guide to Supporting Postpartum Families in 2002. The premise of the phase, “mothering the mother” is the keystone of the message conveyed to perinatal families through a method of conversational, non-judgmental emotional support. This approach believes that 1) every mother needs a mother, 2) if a mother is not well, then her family is not well, and 3) mothers deserve care and are worthy of being the focus of society’s attention. As previously stated, there is a universal message expressed throughout the perinatal social support movement. It has three simple components: 1) you are not alone, 2) you are not to blame, and 3) you will be well, your experience is real and there is help available. The author’s Steps to Wellness includes the following: 1) Education, 2) Sleep, 3) Nutrition, 4) Exercise and Time for Myself, 5) Sharing with Non-Judgmental Listeners, 6) Emotional Support, 7) Practical Support, 8) Referrals to Professional, and 9) Plan of Action. The first Step to being healthy is education because it confronts both denial of a problem and ignorance surrounding that problem. It also provides information and options for treatment. The expression “knowledge is power” is founded on the premise that without accurate information we become passive victims and fearful. If we can learn then the fear is diminished. Reading accurate materials and listening to informed individuals is critical to maintaining and/or returning to good health. The third Step is nutrition. A majority of postpartum women may be eating poorly, some may be malnourished, and a few even starving themselves. The role that a social support person provides is asking the following important questions: 1) Do you have an appetite? 2) What are you eating? 3) What have you eaten today? and 4) What’s there to eat in your kitchen? The appetite center in the brain is responsible for the feeling of hunger. The mother’s (and sometimes the father) inability for adequate nutrition may require medical intervention as well as psychologically emphasizing the important message that if the mother’s not healthy, no one will thrive, including the baby. The Fifth Step is sharing with non-judgmental listeners. Parents need to ask the question, “Who can I talk to about my feelings?” This is a risky proposition if one is surrounded by advice givers who may be well-intentioned but not informed and highly judgmental. The brain can also “shut down” and prevent verbalization. Social support networks surround mothers and fathers with validation and reassurance. The goal is to offer hope that no matter what, it is okay to express negative emotions or experiences. Step Six is the emotional support that is given back in response to step Five. All new parents need and deserve emotional support from one’s friends, family, faith community, professionals, and others in order to heal. There may be a range of reactions from the normal adjustment issues of parenthood to tremendous emotional turmoil, including mental illness. It takes time to listen well and it requires time. This step may be provided by anonymous volunteers over a telephone, in a group setting, or between friends. Empathy is the foundation of this type of caring and concern. Step Seven is practical support, sometimes called material help. Ideally, this step can be planned for in advance of the postpartum period. It may have already begun during pregnancy with help for household chores. If a social support network is established prior to parenthood it eases the burdens, including financial and lack of time, of “normal” adjustment. When illness intervenes a crisis can be avoided through the existence of individuals who can assist the family with cooking, cleaning, shopping, and childcare. The Eighth Step is offering referrals to professionals and other resources. This includes doctors, therapists, and social support networks. There is a general rule that applies to offering a referral to a paid professional. Three names should be given to someone seeking a referral. There is also the consideration of insurance. It can become a cycle of frustration to find a professional but it is hoped that one’s primary care doctor can work with new parents. In the perfect community there is a social support network in place that can facilitate this process as well. The final Step is called a Plan of Action because it takes the parent from being in a place of denial and/or ignorance to acknowledgment and self advocacy. A parent can begin by self evaluating the previous eight steps by asking, what am I doing well and what could I be doing better? The outcome should then be “what can and should I do next?” The conversation has come “full circle” with the potential for a positive outcome. The development of perinatal parent support networks in our own communities is needed in order to respond to the emotional needs of pregnant and postpartum families. These networks are the heart of social support. Their role is to link consumers with community resources. In a review of research on social support in the early 1980s distinguished three areas of focus: 1) the potential or actual providers of support available to a person, 2) a person’s internal appraisal of the availability and effectiveness of support, and 3) the activities involved in the provision of social support (Boukydis, 1986). The oldest example of a continuously operating postpartum support organization in the United States is Postpartum Education for Parents (PEP). The author and her own circle of social support established PEP in 1977 (Honikman, 1986). The experience of co-founding this all voluntary, community-based non-profit is the basis of Step by Step A Guide to Organizing a Postpartum Parent Support Network in Your Community (Honikman, 2000). Itis a workbook designed in an outline format that has been divided into six stages. Some of the stages and steps can be done simultaneously. Stage 1 asks you to visualize and start an organizational structure in which you will actualize your dream of a parent support network. It is imperative that you find others who share your vision and commitment to make this network real and viable. Stage 2 requires you to research other parent support groups and networks that already exist in your community and beyond. The information and personal connections that you start to make in this stage will shape your decisions in the subsequent stages of this workbook. Stage 3, the Planning Stage, is the most time consuming. It involves the “meat” of this work process. Starting with Step 1, you will begin to formulate your group’s purpose, philosophy, goals, and objectives. In addition, you will make decisions regarding the services to provide and the group structure. There is a discussion of funding, along with volunteer and staff issues. Stage 4 is about implementing the group’s services. The contacts that you developed in previous stages will help you form an advisory board of professionals who serve your target population. The ideas that you and the core committee developed earlier will be turned into printed material and will ­represent your group. Through your groups outreach efforts, the general community starts to hear about what the new network will offer them. The last step is the implementation of service. Stage 5 can feel both concrete and abstract. You deliver services; there’s something to show for your hard work and vision. Yet it can feel anti-climatic when participant level starts low or drops off. If your group offers emotional support, the volunteers or service deliverers may not be able to measure the effects of their interventions/services. There are methods for evaluating a group’s effectiveness, but this part of the process is often neglected. Without Stage 5, your group cannot endure. Stage 6 encourages you to develop partnerships outside your group and to have a bearing on the services of other organizations in your local community. You’ll learn how to set new goals and objectives to keep your group fresh and vital, and, should you care to, how to write your own account of starting the network. This essay has reviewed the history, principles, types, and research of the role of social support in assisting perinatal families. There is a legacy left by decades of dedicated individuals and groups that indicate that mental and physical health require a holistic approach. An evolution of understanding indicates that emotional and practical support is a critical component of quality health care (Logsdon, McBride, Birkimer, 1994). The biological and social scientists have combined their talents and resources to focus attention on the previously overlooked arena of maternal mental health. Postpartum Support International is the leader of the perinatal social support movement. The organization’s goal and objectives are part of a transformation that is outlined by The President’s New Freedom Commission of Mental Health. The goals include: 1) understanding that mental health is essential to overall health, 2) mental health care is consumer and family driven, 3) disparities in mental health services are eliminated, 4) early mental health screening, assessment, and referral to services are common practice, 5) excellent mental health care is delivered and research is accelerated, and 6) technology is used to access mental health care and information (Final Report, 2003). In response to the President’s Commission, the United States Department of Health and Human Services (HRSA) wrote and published a booklet entitled Depression During and After Pregnancy, A Resource for Women, Their Families, and Friends. The recommendations listed are: 1) lean on family and friends, 2) talk to a health care professional, 3) find a support group, 4) talk to a mental health care professional, 5) focus on wellness, 6) take medication as recommended by your health care provider (HRSA, 2006). Author and clinical psychiatrist Valerie Davis Raskin, M.D. captures the essence of this Chapter in her latest book. “A common prescription I give: join a new-mother’s group. Whether it’s a support group for women with postpartum depression, a moms-newly-at-home group…, new mothers are often amazed at the confessions of other women, especially those who don’t live in fear of being judged, for whom shame is not an ever-lurking shadow” (Raskin, 2007). Albee, G. (1982). Preventing psychopathology and promoting human potential. American Psychologist 37: 1043-1050. Beck, C.T. (1992). The lived experience of postpartum depression: A phenomenological study. Nursing Research. May/June. Vol. 41. Beck, C.T., Gable, R. (2000). Postpartum depression screening scale: Development and psychometric testing. Nursing Research. September/October. Vol. 49, No. 5. Blum, D. (2002). Love at Goon Park Harry Harlow and the Science of Affection. Massachusetts: Perseus Publishing. Brockington, I.F., Kumar, R. (1982) Motherhood and Mental Illness. London. Academic Press. Cox, J., Holden, J. (1994). Perinatal Psychiatry Use and misuse of the Edinburgh postnatal depression scale. London. The Royal College of Psychiatrists. Davis, D., Logsdon, M., Birkmer, J (1996). Types of support expected and received by mothers after their infants’ Discharge from the NICU. Issues in Comprehensive Pediatric Nursing 19:263-273. Dennis, C.L., Letourneau, N. (2007) Global and relationship-specific perceptions of support and the development of postpartum depressive symptomatology. Social Psychiatry Psychiatic Epidemiology. May; 42(5): 389-95. Gerrard, J. Elliott, S., Holden, J. (1994). The Management of Postnatal Depression Trainers manual. London, UK. Sinsbury Centre for Mental Health. Giberson, K. (2003) Learning about love the hard way. Science & Spirit. Volume March April, pp. 25-28. Hamilton, J.A. (1962) Postpartum Psychiatric Problems. St. Louis. The C.V. Mosby Company. Honikman, J.I. (1986). How to start a parents’ organization in Support for Parents and Infants A Manual for Parenting Organizations and Professionals. Edited by Boukydis, C.F. Z. New York: Routledge & Kegan Paul Inc.
Honikman, J.I. (1999). Role of self-help techniques for postpartum mood disorders in Postpartum Mood Disorders. Edited by Miller, L.J. Washington, DC. American Psyciatric Press, Inc.
Honikman, J. I. (2000). Step by Step: A guide to Organizing a Postpartum Parent Support Network in Your Community. Santa Barbara, CA. Author. Honikman, J. I. (2006). The role of Postpartum Support International in helping perinatal families. Journal of Obstetric, Gynecologic, & Neonatal Nursing September/October Volume 35, Number 5. 659-661. Health Resources & Services Administration (HRSA). (2006). Depression during and after pregnancy A resource for women, their family, and friends. Maryland. United States government. Kelleher, J. (2002). 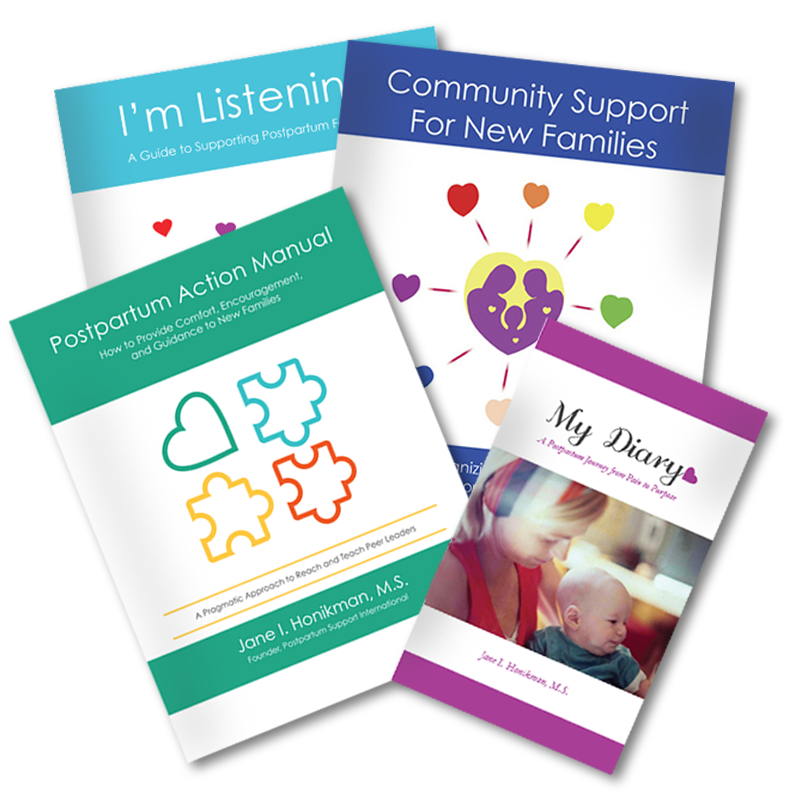 Nurturing the Family The Guide for Postpartum Doulas. Xlibris Corp.
Kendall-Tackett, K.A. (1993). Postpartum Depression A Comprehensive Approach for Nurses. Newbury Park. Sage Publications. Kendall-Tackett, K.A. (2005) Depression in New Mothers Causes, Consequences, and Treatment Alternatives. New York: The Haworth Maltreatment and Trauma Press. Kruckman, L.D. (1996) An anthropological view of postpartum depression.disorders in Postpartum Psychiatric Illness A Picture Puzzle. Edited by Hamilton, J.A. and Harberger, P. N. Philadelphia. University of Pennsylvania Press. Lee, L.C, et al. Child care and social support modify the association between maternal depressive symptoms and early childhood behaviour problems: a US national study. Journal of Epidemiological Community Health. April; 60(4):305-10. LeRoy, H. A., Kimble, G. A. (2003). Harry Frederick Harlow: And one thing led to another…From Portraits of Pioneers in Psychology Volume V. Washington, DC. American Psychological Association. Logsdon, M.C., McBride, A. B., Birkimer, J.C. (1994). Social support and postpartum depression. Research in Nursing & Health. 17. 449-457. Logsdon, M.C. (2003). The postpartum support questionnaire in Measurement of Nursing Outcomes, 2nd edition, volume 3: Self care and coping. Edited by Strickland, O.L. and Dilorio, C., New York. Springer Publishing Co.
Logsdon, M.C. (2000). Social support for pregnant and postpartum women. Association of Women’s Health, Obstetric and Neonatal Nurses. Washington, D.C.
Madara, EJ. (1990) Maximizing the potential for community self-help through clearinghouse approaches. Prevention in Human Services 7:109-138. O’Hara, M. (1995) Postpartum Depression: Causes and Consequences. New York. Springer-Verlag. Raphael, D. (1970). When mothers need mothering. The New York Times Magazine. February 8,67-69. Raphael, D. (1975). Matrescence, becoming a mother, A “new/old” rite de passage. From Being Female Reproduction, Power and Change. Chicago: Aldine Publishing Co.
Raphael, D. (1976) The Tender Gift Breastfeeding Mothering the mother – the way to successful breastfeeding. New York. Schocken Books. Raphael, D. (1981). Why supportive behavior in human and other mammals? American Anthropologist. 83, 634-638. Raphael, D. (1988). New patterns in doula client relations. Midwife Health Visitor & Community Nurse 24,376-379. Raphael, D. (1989). Support and variation, the needs of the breast-feeding woman. Acta Paediatrica Japonica. 31, 369-372. Raskin, V.D. (2007) The Making of a Mother Overcoming the nine key challenges from crib to empty nest. New York. Ballantine Books. Segre, L.S., Losch, M.E., O’Hara, M. (2006). Race/ethnicity and perinatal depressed mood. Journal of Reproductive and Infant Pschology. May. Vol. 24, No. 2. pp. 99-106. Surkan, P.J., et al. The role of social networks and support in postpartum women’s depression: a multiethnic urban sample. Maternal Child Health Journal. July 10(4): 375-83. Taylor, V. (1996). Rock-a-by baby Feminism, Self-Help, and Postpartum Depression. New York: Routledge. United States Commission on Mental Health (2003). Achieving the Promise: Transforming Mental Health Care in America. Rockville, MD. Wile, J., Arechiga, M. (1999) Sociocultural Aspects of Postpartum Depression in Postpartum Mood Disorders. Edited by Miller, L.J. Washington, DC. American Psyciatric Press, Inc.
Zola, I. K. (1979). Helping one another: A speculative history of the self-help movement. Archives of Physical Medicine and Rehabilitation. Vol. 60, pp. 452-456. © 2019 JaneHonikman.com. All Rights Reserved.